Tim Turner, KIUL Radio, was presented with the Ambassador of the Year award at the 2014 Annual Banquet. Turner went above and beyond the Ambassador expectations throughout the year helping the Chamber achieve its goals. 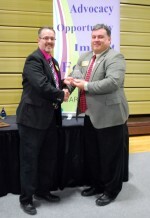 Turner is shown here recieving the award from Chamber President Steve Dyer. This committee acts as the goodwill arm of the Chamber and makes personal contact with Chamber members, asking for their opinions about Chamber programs and current business trends. Assist with implementation of the Chamber Banquet. Assist with the Chamber Golf Tournament. Attend and assist monthly Membership Breakfasts. Attend Business After Hour events. Participate in the Meals on Wheels program. Promote the Chamber and all its activities. Represent the Chamber at ribbon cuttings, ground breaking ceremonies and other public functions. Strive to visit every active member within 24 months. Encourage members to attend Chamber activities. Solicit suggestions for improvement for business in general, for their business in particular, and for the quality of life in the Finney County area. The Ambassadors are the premier group of the Chamber. Membership is by nomination and approval only and requirements are for entry and longevity are strict. 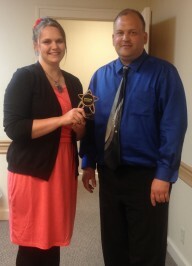 It is an HONOR and a PRIVILEGE to be Garden City Chamber of Commerce Ambassador.